GreenAve.com? That might have been the name of this blog if Eastlake’s original street names had been left intact. Check the attached map to see what I mean. It’s a detail section of an 1893 city ward and precinct map posted recently on Flickr by the Seattle Municipal Archives. You can view the whole map here on Flickr. Be sure to check out the larger size because the interesting stuff is in the details. You’ll see that most of the street names in Eastlake in 1893 bear no resemblance to the names we know now. Eastlake Avenue? The street is there but not the name. It’s labeled as Green Street. In fact several familiar streets have unfamiliar names, many of them colors. Franklin is Indigo. Yale is Yellow Street. Minor is Orange. And a little piece of what would be Fairview is labeled Red. A few contemprary names are on the 1893 map: Allison, Shelby, Hamlin, Roanoke, Louisa. Lynn is known as Angie. Boston is called Grace. Edgar shows up but it’s a little longer: Edgard. Over the hill, Fuhrman is called Randall. I’m intrigued by the cluster of small streets west of Louisa. Several of the names aren’t legible in this photo, but the east/west street between Roanoke and Louisa is: Clatsop Avenue. And speaking of small streets, check out Short Street on the point where Gas Works Park now stands. If you look at the southern end of this enlargement, you’ll see that Franklin makes an appearance, but it doesn’t apparently connect with the northern part of the street. Local writer Benjamin Lukoff notes in a comment on the Municipal Archives Flickr page that there was a great renaming of streets in 1895. It would be interesting to know how our current names came about. More photos from the Seattle Municipal Archives can be found here on Flickr. They have a Flickr set of just historic city maps. This entry was posted in Uncategorized on June 25, 2010 by cdmilton. The avenues follow the order of the spectrum, but what happened to Blue Avenue? there’s still a Martin street but it is now truncated and north of Allison instead of South of it, and it is on the East side of Violet/Boylston instead of the West. weird. Yellow -> Yale, which sounds slightly like yellow. Red is still Red, although truncated, and Fairview is to the West of that and non-existant [submerged] in the old map. 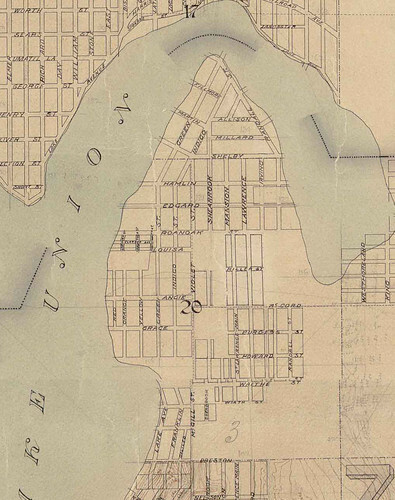 it looks like Eastlake was formed by joining Lake Ave from the South with Green St to the North. similarly, Franklin was formed by joining Franklin to the south with Indigo to the North. Lake Ave is weird. it appears the southern section of Fremont Ave was called Lake Ave and continued into what is now Westlake. But what is now Northlake was also called “Lake Ave” as was the southern Eastlake section of Eastlake Ave.
Grace was probably renamed Boston to match the Boston St in Queen Anne, as was Angie/Lynn. The reverse was true with High St getting the name of little Aloha on the East side of the lake. one really odd thing is that in Queen Anne there was a “Jesse” street running parallel to a “James” street. this is especially odd because the famous outlaw Jesse James [ http://en.wikipedia.org/wiki/Jesse_james] died in 1882, ten years before this map was created. coincidence? i’m way too geeky about this stuff but it would be really cool if all the street sign posts on eastlake were painted green, all the street sign posts on franklin painted indigo, all the street sign posts on yale painted yellow – etc. etc. I’ll be darned! Didn’t know we had a Red Ave. Cool! I probably wouldn’t be hard to get the city to let us do this — interested in trying to make this happen? Count me in on this project! I live on Indigo! Pulling out my crayons tonight to see what color that might be.